I have been writing Dana Treat for a little over two years. In that time, I have shared a lot about the food I make, the things I like and dislike, a bit about my family, a lot about Lopez Island and the special bakery that is there, and thoughts on a new tattoo (photo and story coming soon, I promise). I’ve directed you to other blogs I like and have sung the praises of chickpeas and chocolate. Hopefully I have goaded you into giving tofu a chance and maybe even into trying tempeh. I also hope I have shown you what vegetarian food can be, given the chance. Here is something I’ve never discussed. I’m not really a cheese person. I hesitate to even mention it because I almost feel like I lose some foodie credibility. How can you love food and not love cheese? You don’t eat meat and you don’t like cheese? Who the hell are you anyway?? It’s not that I don’t like cheese. I do like it. I have recipes here that feature cheese – 21 of them as a matter of fact. I guess I should say that I don’t like it much by itself and I tend to use less of it in recipes where it is called for. If there is a cheese platter at your next party, you might see me hovering near it, but I promise you – what I am admiring is the crackers. The cheese plate in a French restaurant? Lost on me. On the opposite end of the spectrum is my friend Michelle. I have known Michelle since I was a lowly promotions intern at a radio station in 1994. As our friendship has grown, we have shared meals together all over Seattle and in Vancouver, Whistler, London, Rome, and Paris. She is a lusty and enthusiastic eater. She often says things like, “This is the best (fill in the blank) I have ever tasted”. As you can imagine, she is fun to cook for. I haven’t asked her about her desert island food, but my hunch if would be cheese. The woman is passionate about cheese. Michelle came to stay with us this past weekend and I knew immediately what I had to make for Sunday lunch. I have a sweet little book called Savory Baking, and in there is a recipe for Chile Cheese Gratin Sandwiches Basically, you bake a chile and cheese filled bread in a loaf pan. Once it is cool, you cut slices of the bread, top it with sliced tomatoes and then top the whole thing with a cheese and butter concoction. Under the broiler it goes for a few minutes and then what you have is basically cheese heaven. Before I tell you how much I liked this recipe, allow me to tell you how much I liked making lunch. Whenever we have friends over on Sunday, it is almost always for brunch. I make some kind of egg dish (like this one or this one), I always make roasted potatoes, and I make some kind of baked good (like cinnamon rolls or coffee cake or petits pains au chocolat). The dishes change, the formula remains the same. This time I thought I would change it up and make lunch instead. This cheese bread, soup, salad. It was a nice change of pace. So, if you set up your tent in the cheese lovers’ camp, this is a good recipe for you. I loved it because the flavors were interesting – not all one note as cheesy things can sometimes be for me. There were canned chiles, red pepper, and jalapeño peppers in the bread so while it was rich, there was also a lot of spice to cut the richness. I was thinking ahead and just doubled the recipe and put the other loaf in the freezer. The next time I serve a hearty soup, I know what I am serving along side. Two notes. Worcestershire sauce is not vegetarian – it contains anchovies. If you care, you can find a vegan sauce at Whole Foods or just omit it. I sprayed my pans with non-stick spray and some of the bread stuck to the bottom, so be sure to grease your pans well. Preheat the oven to 375ºF and butter or spray an 8-by-3-inch loaf pan. Stir the flour, sugar, baking powder, pepper, and salt together in a medium bowl. Add the cheese and gently toss until the cheese is evenly distributed throughout the mixture. Whisk the milk, oil, egg. green chiles, chopped jalapeño, and red bell pepper in another bowl. Pour the milk mixture over the flour mixture and briefly blend with a spatula. The batter will look moist. Pour the batter into the prepared pan and place it in the oven. Bake until the top is golden brown and springs back gently when touched in the center, about 45 minutes. Put the loaf on a cooking rack for 10 minutes and then remove the bread from the pan to completely cool. Put the butter, Cheddar and Romano cheese, Worcestershire sauce, garlic powder, and a little salt in the bowl of a stand mixer fitted with a whip attachment. Whip for 2 minutes on medium speed. Set the oven to broil. Cut the loaf into 8 slices and lay the slices on a baking sheet. 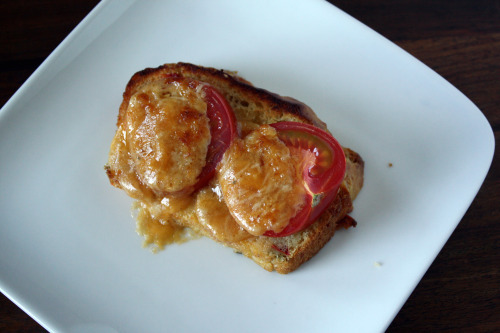 Place a tomato slice on each piece of bread. Spoon about 2 heaping tablespoons of the cheese topping over each tomato slice. Put the baking sheet into the oven about 4 inches away from the flame and broil until the cheese is bubbly and golden, 3 to 5 minutes. Serve immediately. Oh Dana, you’ve just gone up even more in my estimation, if that’s possible! I am not a cheese person either. We’re a rare breed – we’ve got to stick together. This would be too cheesy for me, actually. I am extremely particular about which types I will eat (although sharp cheddar is normally my favourite), and also the forms in which I will eat it. 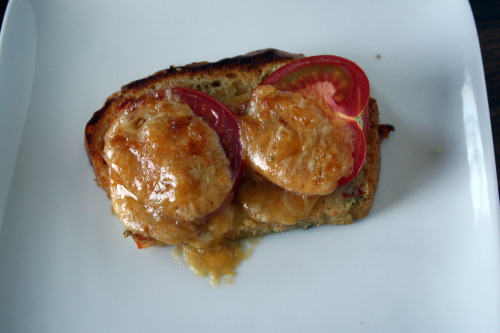 I definitely fall solidly into the cheese lovers camp, so this is just the sort of recipe that gets my blood pumping. Of course, I’m intrigued by anyone whose love for cheese falls short of my own … one of the (many) reasons I keep reading here, I suppose! Cheese heaven is perfect for me! The chiles and tomatoes make this all the better, but the melted cheese looks just fantastic. as a kid i hated cheese, but that’s because i was fed that horrid orange crap inside plastic sheets. i love cheese now, but i love that good stuff cheese, not the processed junk. I love the sound of this bread. This is exactly the kind of meal I would want if I came for lunch. Or, you know. Whatever else you want to serve with melted cheese on top. I set up my tent! I set up my tent! Though I do have to say, I don’t really crave cheese first thing in the morning. A morning omelet, for me, must be cheese-free (and meat-free, too, for that matter). After about 11am, though, I put out the welcome mat for all things cheese, and it pretty much stays out there until the moon rises and my head hits the pillow. I am completely a cheese person and am all over this! Hope you had a fun trip to SF! this looks so delicious! did you use whole foods brand Worcestershire sauce? Hey I just made this bread too! And bought this cookbook. I didn’t do the tomato and cheese on top though. And I loooooooooooooved the bread. One of the best things I’ve made in a while for sure. I wish I was like you and didn’t love cheese! Can’t wait to see what else you make from this cookbook. There are so many amazing options! !